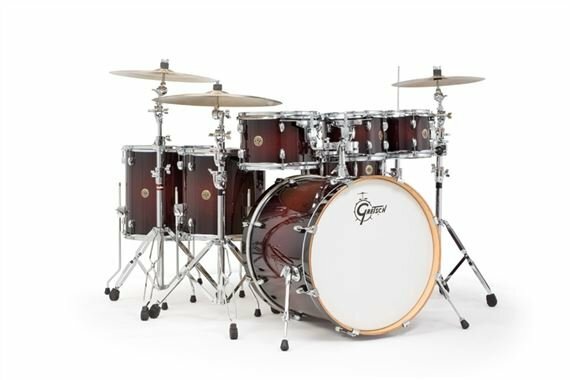 Shop Gretsch Catalina Maple 6 Piece Shell Kit Drum Set Free 8 Inch Tom from AMS with 0% Interest Payment Plans and Free Shipping. Free 8" Tom! $336.91 Value! The Gretsch Catalina Maple CM1 series includes new innovative and sleek hardware designs. Each component is designed for functionality, performance and style. The overall result is a great sounding Gretsch drum set that is ergonomically improved and has a fresh, contemporary design aesthetic. The mounting hardware includes round "gas cap" bass drum mount plate, ultra low profile GTS mounting system, reduced-mass tom mount brackets and new single and double tom holders. Both tom holders include a post hole for a 7/8" cymbal tube post (not included). The ball/socket 12.7mm L-arms provide positioning freedom and a secure hold for stability. Gretsch T-Wing screws and bolts are included on all fittings for drummerfriendly feel and rubber isolators have been added to the die-cast bass drum claws to help keep bass drum hoops looking new. To complete the balanced design aesthetic, a new black/gold Catalina Maple round badge is included on all drums. The new Gretsch Catalina Maple series includes many drum features that have made Catalina Maple series a popular choice among drummers. The shell is a 7-ply Gretsch-formula maple shell with 30-degree bearing edges and natural shell interiors. Bass drums include telescopic bass drum spurs matching maple wood bass drum hoops. Toms/snare feature 2.3mm triple flanged hoops. All drums are fitted with Remo® drum heads, including coated batters and clear resonant on toms/snare and clear bass drum batter head with muffle ring. The white Gretsch bass drum logo head includes muffle ring. Floor Tom: 14 x 14"
Bass Drum: 22 x 18"
Gretsch Catalina Maple CM1 6 Piece Shell Kit is only the drums. Hardware and cymbals are sold separately. I had a few parts missing when it arrived but AMS did a great job of resolving the issue with the manufacturer. I'm extremely impressed with the appearance and sound. Once set up and miked I got tons of props on it. I switched the heads out for Evans bass heads and Aquarian PF2 on the toms...just my personal preference. I'm not a huge fan of the ball and socket mount system but they held perfectly for a 4-hour gig. Excellent drum kit at a price point that is too good to be true. The build quality is top notch and aesthetically they are gorgeous. And if that wasn’t enough, they sound fantastic! Open, rich, responsive and detailed. I highly recommend this drum kit! Wow! What a drum set! I have been wanting to buy this set for a while and was excited when they finally came! My Dad has ppl aged Gretsch Drums since the 1960’s, so I wanted to follow in his footsteps. This kit sounds amazing, thunderous floor toms and the snare just sings. Plus it looks killer under stage lights!! Could not be happier with this set! Well worth the money! thease gretsch drums are very alsome i love them an the walnut coler they sound very good when rocking very exlent drums an for the money. one thing i dont like very much is tom mounts were the rubber rides on toms drums.but other then that they are perfect.i thank you ams for easy payments an makeing wishes an dreams com true.i love ams.good bliss.larry morris. These are extraordinary drums sound amazing!and it was an awesome experience buying them from american music supply! Thanks!